How to understand people’s actions from the stories of their lives. An appreciation of how stories shape lives and re-storying can re-shape lives. How to rewrite the past without erasing past experiences. How to externalise problems in multiple ways. How to make vague problems concrete and manageable. Unique outcomes and alternative story development – become an effective practitioner with the most chronic and complex problems that ordinarily induce despair. How to discern hope in dire situations. How to spot nuggets of gold in conversations that lift the atmosphere. What to look for when a conversation seems negative or hopeless. Move conversations quickly from problem-saturated to problem-solving. How to develop collaborative and respectful ways of relating to clients that makes them the expert on their lives and honours the skills, experience, knowledge and significant relationships of the people who come to meet with us. How to use any piece of information to identify a person’s strong values. How to connect these with other events and figures in people’s lives to clarify a sense of identity so that entirely new perspectives are possible. How to structure conversations: maps to guide conversations; questions that can rescue conversational cul de-sacs; questions that avoid those “yes, but…” replies; question structures that have profound effects on a person’s thinking; questions that make small improvements much bigger; ways to respond when someone says “I don’t know”; questions that consistently move conversations forward; how to understand conversations so that you’re never stuck for a question; how to chart conversations that reveal where and why they got stuck. How to question taken for granted norms and integrate an ethical approach with brief practice. Understand Michel Foucault’s critique of cultural norms and how they affect all our lives. How to discern and appreciate the power of these norms without getting captured by them. How to use language to avoid applying norms to people’s lives. How to provide moving and powerful acknowledgements of people that unstick them from repetitive processes. How to use imagery to evoke strong and positive feelings. How to write simple letters that have powerful therapeutic effects and get changes widely recognised. How to use memories to support people in the present. How to bring figures from the past or mythical characters to life as co-therapists. There are two course formats for Level One training: 1 teaching block of 5 days OR I X 3 day teaching block AND 1 x 2 day teaching block. Both formats offer the same teaching time and course content.Days commence at 0930 and finish at 1630. This module is an exploration of broader social contexts, how these influence all of us in the way we make sense of life and how narrative therapy brings these considerations into practice. These understandings will be explored in relation to a variety of working contexts and practice issues, including eating disorders. This module will include opportunities to learn about the most recent developments in narrative practice. How to respond when people are experiencing an overwhelming sense of personal failure as workers, parents, carers, partners etc: reviewing the Failure Conversations Map. 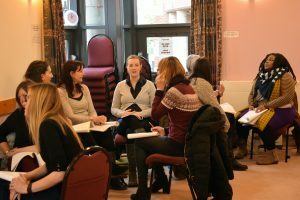 This is an intensive week of focused skills practice around a variety of themes and common clinical dilemmas, for example: what do you do when a young person doesn’t talk? Or when someone has been labelled “hard to engage”, “obstructive” or “defensive”? Or when you’re faced with an entrenched anorexic presentation? Or when someone doesn’t want to be there? All participants are invited to bring a couple of real life dilemmas from their practice for the group to work with. Videotaped or DVD’d examples are particularly welcome. Additionally, there will be opportunities to be interviewed and experience an Outsider Witness Group. We will practice using different maps in interview scenarios, linking the maps together and charting conversations as we go. Interviews will be reviewed and learning points detailed. This module will be hard work but the atmosphere is highly supportive. 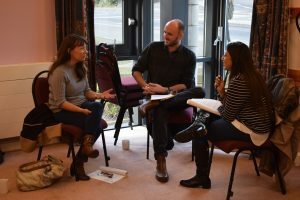 We are confident that participants will experience a clear advance in their narrative practice skills, and that these skills will be relevant to a variety of work and clinical contexts. Using the scaffolding Distance meta-map to guide questioning sequences in live and role-played clinical interviews. Using “Therapist Positioning” ideas to orientate ourselves in de-centred but influential ways when under pressure. Opportunities to be interviewed about your work and to be at the centre of Outsider Witness Group reflections. Supporting the learning of others using different styles of feedback. Reviewing videotape of clinical practice and participating in peer supervision. Intensive focus on the micro-skills of practice – the language, the sequencing of questions and the moment by moment attunement to the interviewee’s experience. How to spot ideas about learning that could slow your progress. Getting back up to speed with stories, maps and questions. Refining skills in using narrative maps to guide your questions. Learn ways to chart therapeutic conversations that identify new areas for enquiry. Orientate to the different ways that values get expressed in conversation. Conversational structures that support the development of these into rich accounts of preferred stories and action. Why it happens, what it means and the most therapeutic ways to respond. Ways to support protest against injustice that empowers clients. How to recognise power practices and what to do about them. Learn how the practice maps fit together and how to develop dexterity in questioning skills. The implications of Vygotsky’s research for clinical practice. How the politics of gender and power can be exposed. Expert knowledge, truth claims and how to address them. How to make visible the prescriptions and promises of discourse to enable people to expand the range of possibilities for action in their lives. Why do people experience a sense of failure in their lives? A review of the ideas of Foucault and Deleuze. Therapeutic framework to guide responses to expressions of despair and failure. How to give great supervision that empowers the supervisee. How burnout happens and the ways that Western culture contributes to it. How to develop an anti-burnout practice that is invigorating for you and will surprise your colleagues. There are two course formats for Level One training: 1 teaching block of 5 days OR 1 X 3 day teaching block AND 1 x 2 day teaching block. Both formats offer the same teaching time and course content. Days commence at 0930 and finish at 1630.